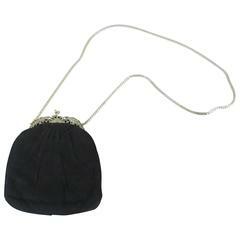 Vintage Black Evening Bag is highly desired by all collectors of Judith Leiber! 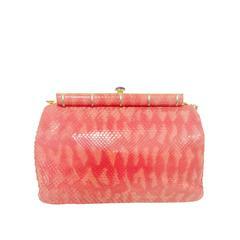 Featuring gold tone hardware and slightly gathered, butter-soft python allover, bag easily converts from clutch to shoulder bag using python strap with minimal effort! Forgiving gusset accommodates more items as necessary. 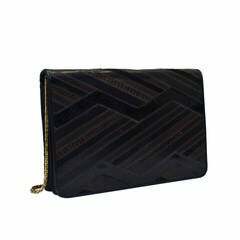 Interior has one zippered pocket. Fully lined in black fabric. The "Wow Factor"? Snap closure is highlighted by black and white color blocked elements reminiscent of lacquer and bone! 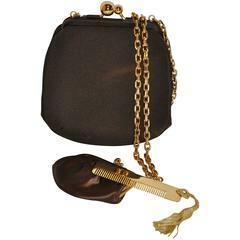 May be worn crossbody. Made in Italy. Excellent Condition. Strap Drop: 22". Dustbag included. 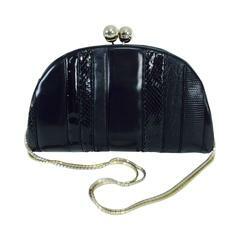 Judith Leiber Black Crocodile Shoulder Bag $999 15" x 9.5" x 4"